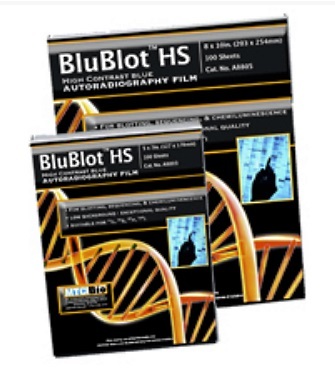 BluBlot™ HS is a high quality, blue sensitive scientific imaging film that is ideal for a wide range of electrophoretic and autoradiography applications. It can be used with calcium tungstate or blue-emitting rare-earth screens. 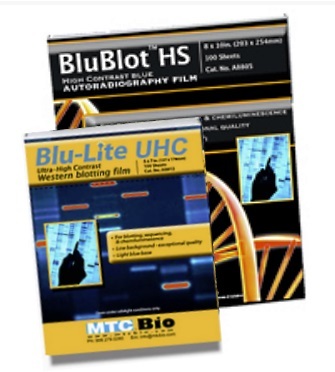 BluBlot™ HS exhibits excellent sensitivity and contrast characteristics with all types of labeled samples, even with low levels of radioactivity. Both films are coated on both sides (double emulsion) for improved consistency and overall performance. They are compatible with automatic processors and manual development methods, comparing with films costing several times as much. 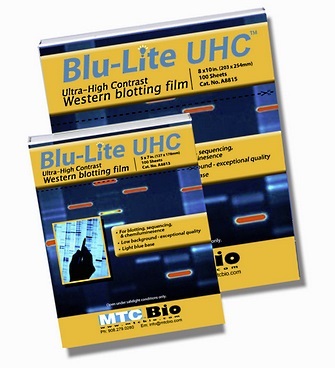 For exposure of protein experiments and DNA sequencing gels, for Western Blotting, Sequencing, Chemiluminescent Autoradiography (ecl), and Gel Shift Analysis, Samples labeled with high energy, Beta-particle-emitting isotopes such as 14C, 125I , 32P , or 35S may be exposed directly or with intensifying screens. The films are supplied in two sizes, 127 mm ×178 mm and 203 mm × 254 mm, packaged 100 films interleaved in a light-safe dispenser box for protection, yet easy access. They should be kept in a dry and cool environment, away from any form of stray radiation, and when properly stored have a shelf life of 2 years from the date of manufacturing.